James Arness was an American actor famous for his role as Marshall Matt Dillon in Gunsmoke. Gunsmoke began in 1955 and was the longest running TV drama series at the time. Arness had the Sun in Gemini with Pisces rising but the difficult part of his chart was the conjunction between the Moon and Saturn in Libra in the seventh house. The Moon in Libra in the 7th would create a very strong need to find the perfect relationship but the conjunction with Saturn would bring obstacles, difficulties and obstructions in this area. Arness was married twice and was separated from his 2nd wife for a short time. When asked why he went back to her Arness said, “Women, can’t live with them, can’t live without them. Might as well suffer and live with them.” This quote nicely sums up the Moon / Saturn conjunction. James Arness’ Moon is in exact square aspect to Pluto ( they are only 11 minutes apart ). Pluto is in Cancer in the 4th house and such a powerful contact between the Moon and Pluto here would point to enormous turmoil, disruption and even catastrophe within the family. Pluto in Arness’ chart is ahead of the Sun so the most powerful aspect that it would make during his lifetime would be the conjunction to the Moon in 1975 to 6. This would be a major watershed in his life. Gunsmoke came to an end after 20 years in 1975 but also his daughter Jenny Lee Aurness committed suicide in May of that year. James and daughter Jenny were very close and they had close astrological aspects with their Suns in conjunction in Gemini and James Moon was in square to Jennys Ascendant. Jenny Lee Aurness had a very close Moon / Pluto conjunction, an aspect that tends to bring considerable emotional upheaval. This combined with the Gemini Sun and Cancer rising with Uranus conjunct the Ascendant points to an emotional and sensitive person who would find it difficult to settle. Aurness had a relationship with rock singer / musician Greg Allmann and was so devastated by his new relationship with Cher, who he later married, that she committed suicide in May 1975 by overdosing on pills. 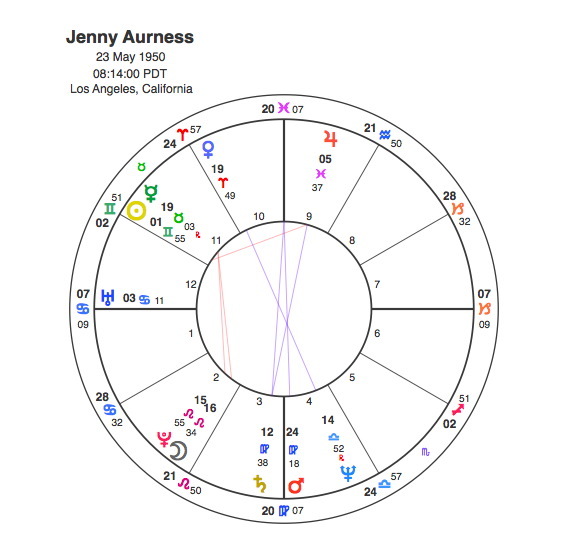 Pluto only made two major aspects in Jenny’s lifetime, one in early childhood, the second was in 1975, square to her Ascendant. Jenny Aurness’s Sun was conjunct Gregg Allman’s Ascendant so the power of her attraction to him was strong. Allman, however has a very powerful Sun / Jupiter conjunction in Sagittarius in the 7th house in opposition to Uranus. Sun / Jupiter in Sagittarius would always bring lots of experience with a drive to constantly widen horizons and look for new targets and as it’s opposite Uranus and the conjunction is in the seventh house of relationships we’re talking about lots of changes. 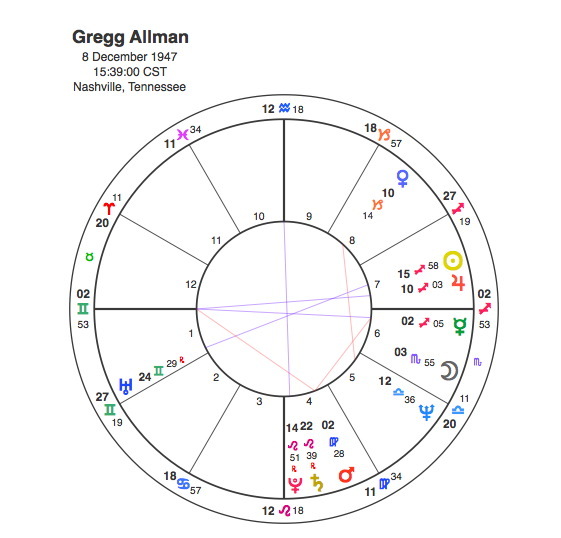 Allman married six times and had other relationships as well, exactly what would be expected of this chart, so with one partner always looking for new experience and another feeling very insecure it was likely that the relationship wouldn’t last long. Jenny’s mother Virginia Chapman / Arness was married to James from 1948 to 1963. There is no birth time available for Chapman but her Moon is in Libra and if she was born in the morning would be conjunct James’ Moon. Like Jenny, she has a Moon / Pluto aspect, in this case the square. Just like her daughter Jenny, Virginia died of an overdose in 1976. It is not known whether the overdose was intentional or not or whether Jenny’s death the previous year was a contributory factor. If Virginia was born in the morning Pluto would be conjunct her Moon in 1976 unleashing the energy of the square aspect in her birth chart. In some cases it is possible to see a person’s death in their chart, particularly if it is unusual and Pluto, the planet of death and rebirth is usual involved somewhere. Jenny and Virginia both probably had Moon / Pluto aspects at birth and died when Pluto next made a connection to their Moon. Virginia’s Pluto was probably conjunct her Moon when she died and Jenny’s was conjunct her Cancer Ascendant ( which is ruled by the Moon ). All three of the Arness family had strong Moon Pluto aspects but it is often the case that the strongest transits for a person’s death would be the ones in the partner or loved ones charts, after all they are the ones left behind to carry on living so the impact on them is a continuing one. 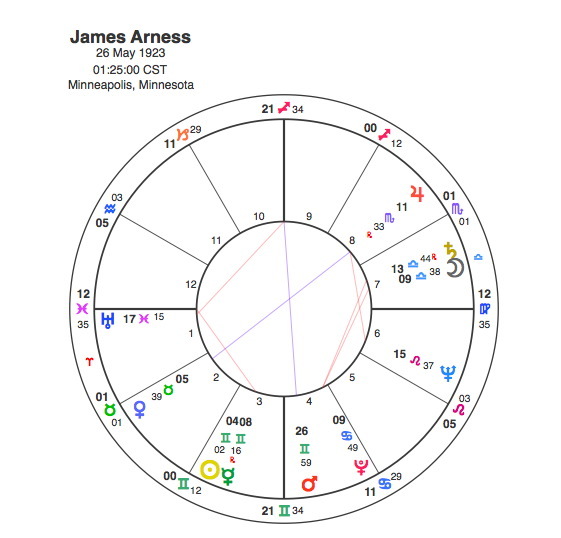 James Arness had an extremely difficult Moon / Saturn conjunction in his 7th house in square to Pluto in the 4th house. The most powerful transit of his life was Pluto to his Moon in 1975 – 6 executing the threat of catastrophe that was indicated in his birthchart. Under this transit his daughter ( Moon, 4th house ) and his ex wife ( Saturn, 7th house ) both died ( Pluto ). A watershed in his life without any doubt.